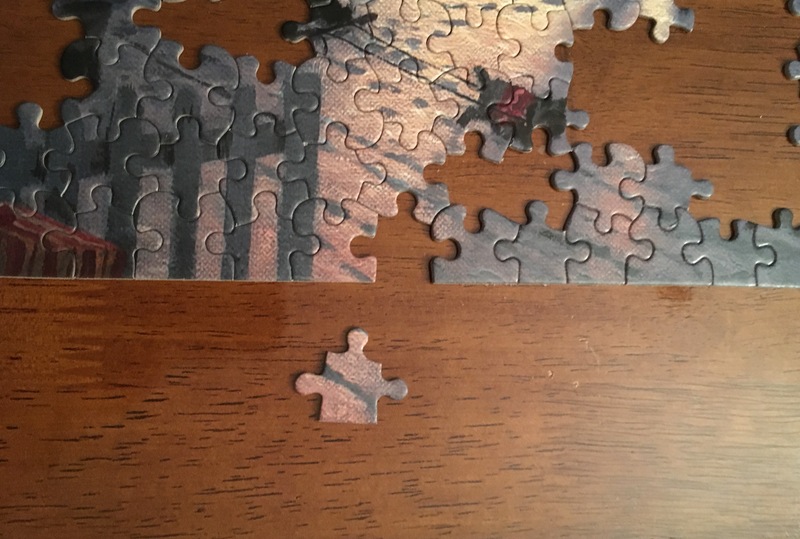 This border puzzle piece had been missing for a little over a week. I’ve searched everywhere. I’ve had the family searching everywhere. If you know me, you know I’m a bit obsessive over order and completing things. I was so discouraged that I would not have a complete puzzle. Today this missing piece was found. I could not be happier. Unfortunately I’m exhausted so I will not be working on my puzzle tonight. The entire time I was searching and today when this piece was found, my mind kept being drawn back to the parables of the lost sheep, coin, and son found in Luke 15. I couldn’t help but make the same parallels of how our shepherd searches for what is lost, how we feel at a loss when one thing is missing from our numerous amount, and how we can rejoice over finding what was lost. I’m thankful for these little reminders of how our Father feels when what was lost has been found.